a premier consumer financial services company. gifts, seeking to earn rewards. agree they “still splurge” on holiday shopping. 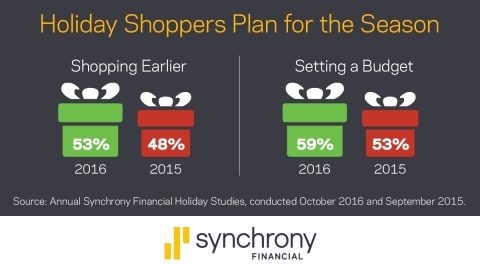 indicators to develop its holiday shopping forecast. Study and other Synchrony Financial research. conducted Sept. 30 – Oct. 3, 2016, by RTi Research. period increase based on analysis of macroeconomic variables and trends. Synchrony Financial Sixth Annual Digital Study, July 2016. The Nilson Report (May 2016, Issue # 1087) – based on 2015 data. Editor Note: Graphic data representations are available.